A new virtual tour and interactive map at the Stevens Institute of Technology combines photorealistic views 3D-rendered structures to provide an immersive way to "visit" the 55-acre New Jersey campus. Anyone with an internet connection can access the map, which is enhanced with videos, images and links to additional information. Powered by technology from CampusTours, the map includes a guided virtual tour option that "presents a sequential series of video tour stops that provide a glimpse into the facilities, laboratories, residential and recreational spaces a typical Stevens student would experience," according to a news announcement. Users can also jump to any point of interest to access detailed descriptions, images and video commentary from Stevens faculty and students. CampusTours' MultiMedia Engine allows Stevens to manage the video library and update it over time. 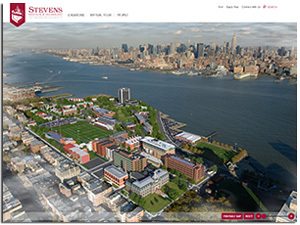 "The interactive media offers a way to virtually explore Stevens' vibrant living and learning environment," said Lisa Fayed, director of digital strategy and analytics at Stevens, in a statement. "The video commentary covers a variety of topics from the students' perspective, from summer internships and co-op experiences to networking opportunities and developing lifelong friendships at Stevens. This platform aims to not only give prospective students, their families and others a view of Stevens' beautiful campus, but also showcases the unparalleled opportunities through the voices of our community."